I hope I've been able to share some things this week that have helped you in regard to Chaotic Homeschooling. We've discussed what it is, embracing the chaos and other solutions, personal stories, and some sanity savers. You can never really "plan" for the chaotic things that come our way in life but you can think ahead a little - and you alone can choose the attitude you have about it. Just this week alone, we've had a couple things happen that threw us a little out of our loop...but we press on! Although it can be hard to do, we are to be content in all circumstances - chaotic, peaceful, or just average. I myself struggle with this and I imagine a lot of you do too because well, it's hard to feel good when things are falling down around you! I like that the verse says "content." That doesn't mean I have to say, "Yay! We're going through a crazy scary situation! Woohooo!" Instead, it makes me think more along the lines of, "Wow, this is a scary/bad situation...but it'll be okay. I have faith." Paul goes on to say in Philippians that, "...God will meet all your needs according to his glorious riches in Christ Jesus." God will give us the strength to persevere, even through the tough times. We're not promised an easy, chaos-free life - instead we are given hope and strength from the Lord! 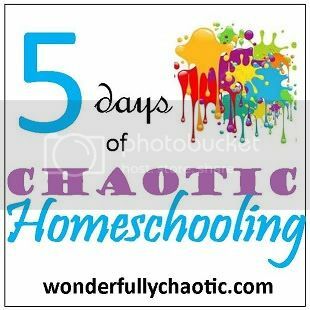 5 Days of Chaotic Homeschooling is part of 5 Days of Blogging with The Homeschool Crew!